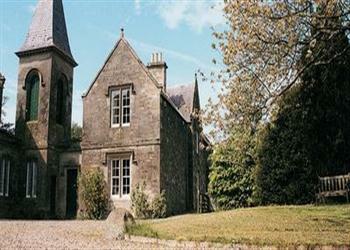 Lochside Stable House in Yetholm, near Kelso sleeps 11 people. This beautiful Victorian house with stunning views over a loch and hills, sits between its own large garden and the flower-filled courtyard of Lochside House. Set within parkland with rare breeds and horses, this comfortable holiday property is extremely well-equipped and superbly furnished with antiques and soft sofas, perfect for relaxing in after exploring the many abbeys, castles and old houses found within the area. The village of Yetholm is made up of two distinct parts – Kirk Yetholm and Town Yetholm, which lie just ¼ mile apart. Situated on the edge of the Cheviot Hills, they mark the end of the Pennine Way footpath, as well as the second leg of St Cuthbert’s Way (a 60-mile walk ending at Holy Island in Northumberland). Six miles to the north is Kelso, where surviving ruins belie the fact that Kelso Abbey was once the richest and most powerful in southern Scotland, and took eighty years to build. Kelso lies at the confluence of the River Tweed and River Teviot, a renowned spot for salmon fishing, and a short walk leads to Floors Castle, a huge castellated mansion overlooking the Tweed, which is open for visiting (April to Oct). Shops 1½ miles. Hall with polished oak floor. Living room with open fire and sofa-bed (for +2). Spacious drawing room with grand piano, portraits, games, toys and books. Farmhouse kitchen/dining area with Aga, electric oven and hob. Utility. Cloakroom with toilet. First floor: Family suite: Double bedroom with four-poster bed, single bed (for +1) in dressing room and en-suite bathroom with electric over-bath shower and toilet. Double bedroom with four-poster bed. Two twin bedrooms. Bathroom with over-bath shower and toilet. For a better idea of where Lochside Stable House is, you can see Lochside Stable House on the map below. Do you want to holiday near Lochside Stable House (UPK), you can see other cottages within 25 miles of Lochside Stable House; have a look to find your perfect holiday location.